A GREAT COURSE: First and foremost, it's all about the course itself. 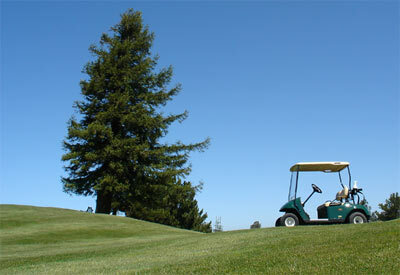 You'll quickly find that most players who have never been here before have yearned for years to play at Crystal Springs. Every time they drive down I-280 and spot the reservoir in the distance, they've wanted to pull over and get their clubs out of the trunk. And the ones who have shared 18 with us want to come back again and again. Crystal Springs will be a great attraction that will increase your turnout, no matter what kind of event you are planning. Our course offers you and your guests awe-inspiring scenery of the 20-mile-long Crystal Springs Reservoir and the Coastal Range, as well as glimpses of deer, hawks and other birds. After all, we are part of a 32,000-acre wildlife refuge owned by the San Francisco Water Department. This is also a classic course, the work of an early British architect, W. Herbert Fowler, a golf-lover who changed the history of course design. His goal was to let the land shape the course, not vice versa, and that's exactly what happened at Crystal Springs. A GREAT TIME FOR ALL: This is a par-72, championship-style course that will challenge your lower handicappers to use their most strategic shotmaking skills. But from the middle and forward tees, Crystal Springs is a joy to play for higher handicap guests as well. We can provide you with advice on which format to use for your group so that play can move quickly and smoothly during your day with us. GREAT FOOD: We offer delicious cuisine, a necessity when you're dealing with hungry golfers. At Crystal Springs, our food events are catered by Fairview Events, which also runs our restaurant. We can provide box lunches – turkey, tuna or beef – to take out on the course, a Wild West barbecue with grilled chicken and tri-tip or a deli buffet. Or perhaps you want to have a fantastic awards banquet in our clubhouse after play concludes. We can serve a prime rib buffet or a dinner customized to your group for up to 200 people in our dining room overlooking the 18th fairway. A GREAT LOCATION: Crystal Springs Golf Course is conveniently located for your guests off I-280 in the Burlingame-Hillsborough area. We are just 20 minutes south of San Francisco, 40 minutes north of San Jose and 11 minutes from San Francisco Airport. GREAT SERVICE FROM EXPERIENCED PROFESSIONALS: Planning a golf tournament can be a tough job, but at Crystal Springs we can make it a fun experience for you as well as for your players. We hold dozens of outings each year and we know how to do it right, whether you are designing an outing to express your appreciation to employees, an event to draw new customers for your business, a charity or non-profit event which must draw revenue for a good cause or an intimate round for family and friends, perhaps as part of a wedding or reunion. Event prize credit -- Your tournament fee will include a food and beverage and merchandise credit. These monies can be applied to merchandise purchases from the golf shop, gift certificates for your winning team. Special touches -- Our PGA Members and apprentices can offer an instructional golf clinic before your group heads to the first tee. Subjects can be pre-shot routine, set-up and posture, full swing, putting, rules and etiquette. Our pricing structure is based on the number of participants. Give us a call to find out more. Special prizes for your group to remind them of the big day -- Bag tags, logo golf balls, logo shirts, or any other item personalized with your organization name is a nice way to commemorate your event. Please allow 4 to 6 weeks for set-up and delivery. Practice before they play -- Your guests can use our driving range for unlimited warm-up practice. Costs vary depending on group size. Rental clubs -- Many of your out-of-town guests may not have their own clubs. Rental sets are available for $50 per set and will be waiting on your guest's cart if you give us advance notice. Personal service that makes you and your guests feel at home – The following professional services are provided at no extra cost: help in choosing a format of play, placement of proximity markers, contestant scorecards and scoreboard, placement of tee and green signs, personalized golf cart placards, bag loading services, marshals on course during play.